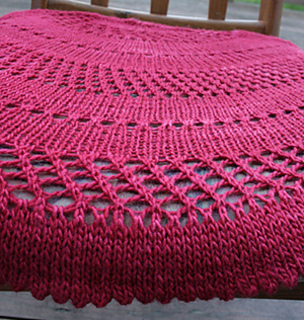 This is a half pi shawl pattern comprised of mostly stockinette, with lace insertions every 12 rows. The lace portions are either a single row of eyelets, or a 12-row eyelet lattice. 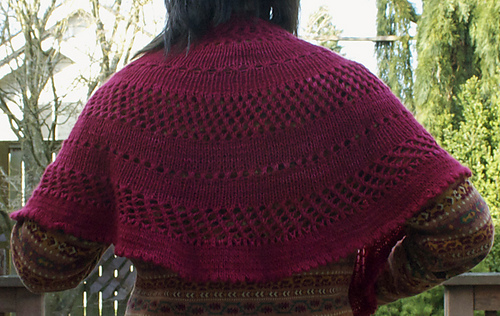 The shawl is worked from the back of the neck to the bottom edge, with L1L (left lifted) or yo (yarn over) increases every so many rows to increase the row length to a maximum of 260 stitches. 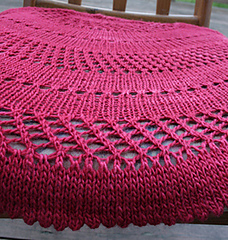 It finishes with a picot edge that is made by knitting a row of eyelets, then a couple more rows, then it gets folded over and sewn with yarn (mattress stitch or similar). Errata: May 13, 2012 I made Revision 2, which contains minor changes to number of rows 35-48 in Arc 5. Errata: July 1, 2012 I made Revision 3, which contains minor changes to the row numbering in Arc 5. Errata: Oct 23, 2012 I made Revision 4, which contains a minor change to the row number in Arc 5. The latest version is available in the link above! NOTE; If you wanted to make it larger, in Arc 6, row 12, you could just call that an eyelet row and do another 12 rows of stocking stitch, then another 12 rows of the eyelet lattice insertion, another 12 rows of stocking stitch, and so forth. Eventually you need to increase your stitch count if you want to keep going beyond a certain point. So for example, when Arc 6 has a total of 96 rows, you’d do increases (just like previous increase rows) on the 96th row if you wanted to keep going past that. 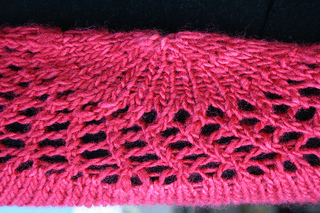 And you’d follow the basic pattern of alternating a pattern section with an eyelet row.